i have never made a baked macaroni and cheese before ( only from the box )and have been anxious to make one so I finally got to try this one last night for dinner. Everyone loved it!! They said it's a keeper!. So to prepare this recipe you need first to heat oven 350 Degrees . 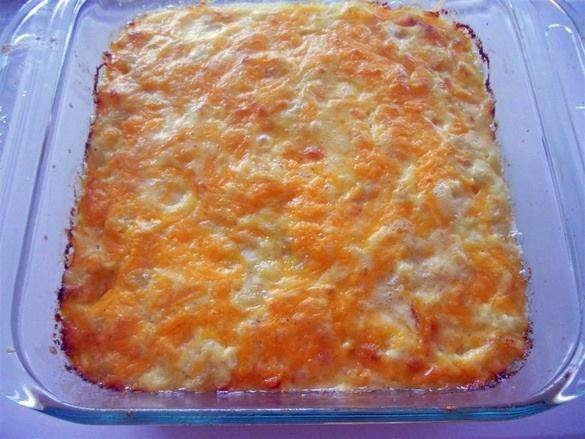 and after that you need now to prepare a dish for working , i prefere a deep sided 9×13 pan by coating with cooking spray. Then for sure set aside. Second step : No lets move to the next step , so at this step you need to bring a large pot of water to a boil. Then you need to add salt, next make sure to follow the package instructions to cook elbow macaroni till tender. Now after all that you need next to drain then transfer the macaroni noodles to the baking pan. Step 3 : One time the macaroni is cooking, you need to take a separate bowl and mix the milks & eggs . So make sure to whisk till thoroughly xombined. Then all what you need is to add the other ingredients , so add the butter, cheeses, sour cream, salt, pepper, & sugar then you need to stir to combine. Next pour over the macaroni ^then again stir to combine.